The transition from silent film production to talkies was a rough one for everyone in the industry. All at once audiences wanted sound and lots of it, and films that had been in production faced uncertain futures. Some were released with music tracks, others reshot or scrapped entirely. 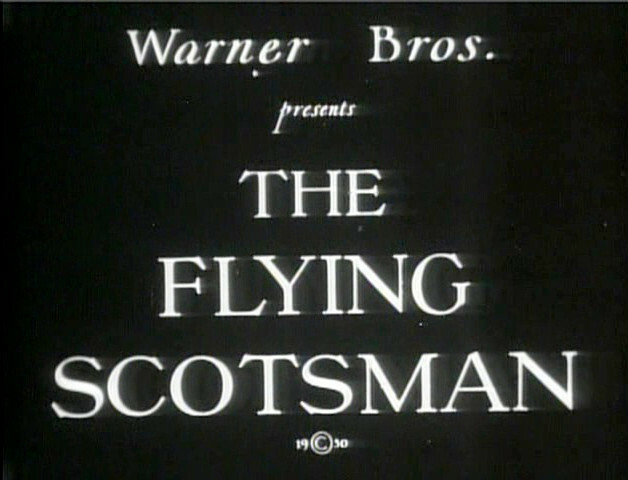 Then there were oddities such as The Flying Scotsman , which switches to sound partway through. The Flying Scotsman is a train that travels between London and Edinburgh. Engineer Bob White (Moore Marriott) has one final run to make before retiring, and he is proud of his spotless record and reputation for keeping the schedule. Of course, his last day is going to be anything but easy. Former fireman Crow (Alec Hurley), reported by Bob for drinking on the job, plans to sabotage the train. Additionally, replacement fireman Jim (Ray Milland) is a frivolous sort who’s set his eyes on Bob’s daughter, Joan (Pauline Johnson). Bob realizes that Jim has been talking about dating his daughter. At 50 minutes, this is a tight, fast-paced film. There are only a few threads to bring together, but they need to be established and set on course. This happens largely in the first part of the film, which starts at the end of Bob’s 2nd-to-last day. Crow is fired, Jim is introduced as his replacement, Joan is seen to be Bob’s doting daughter, and then Jim and Joan meet in a dancehall. Most of the first day’s action concerns the meet-cute between the young couple. The next day is the run itself, and it’s a great piece of action filming that carries propels the story to a happy ending. The first sound scene takes place in the staff canteen. It hits hard with a cacophony of background chatter and ends in a slugfest. Aside from the obvious split between silent versus talkie, the romance and sabotage plots divide the movie in half. They do intersect, adding some breadth to both, but neither is particularly integral to the other. Joan is the glue that holds it all together, and I maintain that Pauline Johnson is the true star of the piece. Having been chastised by her father the night before (for having had a young man on the house), she nonetheless commits herself immediately to stopping Crow’s scheme, jumping the train and even following him on a trip outside of the racing vehicle. Her love for Jim and for her father are separate issues, but they combine in her and shape both men. 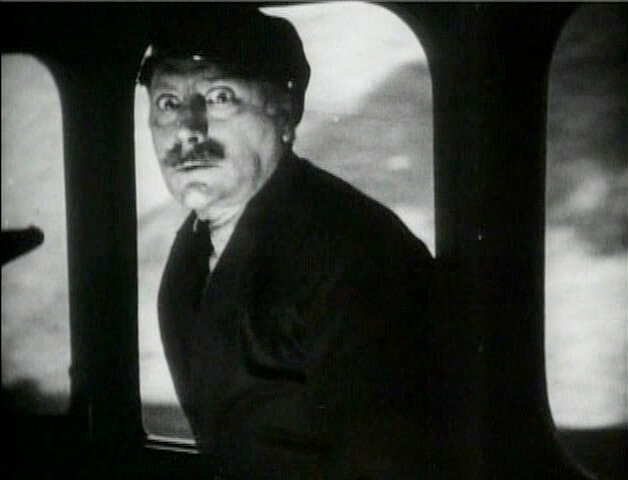 Joan follows Crow outside of the train in a thrilling chase sequence. Naturally, I’m reviewing this movie because one of these men is played by Ray Milland. This was his first major role, and he acquitted himself well. Once in Hollywood he became so aware of his voice that he developed an accent and cadence that lent itself to sophistication and even snobbery. Here he sounds more relaxed, and it’s delightful to hear this freer vocal performance at the start of his lengthy career. He’s not as smooth here as he’d become in the romantic comedies for Paramount, but he’s charming enough to overcome some of the lower aspects of Jim’s character. The script has him do some dastardly things, such as setting up a nebbish to take the wrath of a jealous husband and abandon Joan to the chaos he created in the dancehall. Yet he almost immediately regrets these actions and tries to correct things. He steps back in to fight the husband himself, and he returns to help Joan escape. Maybe it’s this visible attempt to improve that fuels Joan’s attraction to him. Or maybe I’m reading too much into it, and she fell for his boyish grin. Jim’s dance partner sees her husband. I feel that Milland’s role, though seemingly superfluous, reflects the nature of the film itself. Jim begins the film as a bit of a scoundrel but transitions to become reliable at the end. The dedication of Bob and Joan have changed him for the better. The story of how the three bond bridges the divide between silent and talkie filmmaking, demonstrating that the quality was already there and brought out through refinement. The Flying Dutchman is a curiosity, but it’s an engaging one. It’s fascinating to watch cinema change during the course of a movie. As impressive as the chase outside of the train is, the best stunt is that the film embraced the new approach while keeping the old intact.